To commemorate the International Week of the Disappeared, Mugiyanto spoke to the AHRC on his experience as well as the victims’ efforts to encourage legal proceedings on the abduction of activists in 1997-1998. Would you like to share what had happened in relation to the abduction you experienced? When the abduction took place, I was active in an organisation called the Indonesian Student Solidarity for Democracy (SMID) which was affiliated to the People’s Democratic Party (PRD). We had to conduct our activities in secret since 27 July 1996 as our organisation was banned by the government. Our organisation was accused of masterminding the 27 July 1996 riot. I stayed in a rented house that my friends and I called the ‘safe house’ located in Klender, East Jakarta. On 13 March 1998 at around 7 pm I was arrested by around 10 men — two of them were wearing military uniform. From the rented house I was taken to several places including the office of the District Military Command in East Jakarta. I do not know to where else they took me because I was blindfolded during the whole journey but I could hear the voice of my friends Aan Rusdiyanto and Nezar Patria. We were taken to an unknown place we called ‘X’ where we were tortured for two days. I learned later that ‘X’ was the headquarters of Kopassus (the Army Special Forces) in Cijantung, Jakarta. During the abduction, the military asked me about the best solution for the economic crisis ongoing at that time, the independence of East Timor, the reason why I was against the dual function of The Indonesian Armed Forces and why I supported the struggle of the people of Aceh for independence. Two days after I was moved to another unidentified place. Again I did not know what that place was because I was blindfolded. Only later I understood that it was the office of Jakarta Metropolitan Police. We were detained there for 3 months for the allegation on conducting subversive activities because they thought we wanted to overthrow the New Order regime. When I was detained at the Jakarta Metropolitan Police, Munir was the person who was defending me. I met with Munir often since then. Do you know why were you targeted? What kind of activities were you engaged in at that time? At that time my role (in the) SMID was to organize international campaigns in Europe, Asia and Australia. I was campaigning for the release of political prisoners both those who engaged with the PRD and other types of political prisoners. How long were you detained and what exactly happened during this time? I was interrogated for two days. I was blindfolded and stripped that I was only wearing my underwear. During the interrogation I was electrocuted, beaten, threatened, yelled at, and subjected to other inhumane treatment. I do not know who did it because I was always blindfolded. I only knew Nezar Patria and Aan Rusdiyanto were also there because I heard their voices in ‘X’. How did the abuse affect you and your family? My parents live in fear as many strangers came to my house. Some of my neighbours in the village looked down at me because I was detained at Jakarta Metropolitan Police. It is just how most people live in village think: anybody who once had been arrested must have been a bad person. I personally experienced trauma for approximately two years. Every time I heard the sound of a hand transceiver or being alone on the road I was always worried and scared. What do you do to encourage the settlement of the case? The first thing I did was joining the other victims’ and their families and established the Indonesian Association of Families of the Disappeared. I brought together the victims from Aceh to Papua which was facilitated by the Commission for the Disappeared and Victims of Violence (KontraS) in October 2002. I also empowered the victims both mentally and economically. I advocate for the settlement of the case along with KontraS, Indonesian Legal Aid Institute Foundation (YLBHI) and other organisations. We are demanding justice for the victims of enforced disappearance by conducting demonstrations as well as well lobbying various state institutions. 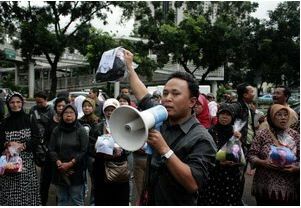 We are probably the only organisation that had held a demonstration in front of Kopassus’s headquarters in Cijantung. We do not do this at the national level only but also at the international level. Almost every year we go to the UN Human Rights Committee and the UN Human Rights Council or send complaints via email. The activities we do are supported by friends from regional NGOs such as AFAD, AHRC, EURO Mediterranean and other regional organisations in Latin America. Who do you think was responsible for the abuse that you endured? No doubt, the persons who are responsible for abducting and disappearing activist during 1997-1998 were former President Soeharto and the armed forces commander at that time. Commander of Kopassus who ordered Rose Team to abduct the activists was also responsible. Those individuals were policy makers when the abduction and enforced disappearance took place. What was the government’s response to the victim’s effort to fight? The government’s responses have been very slow. The victims found the attitude of President Susilo Bambang Yudhoyono is very disappointing on this matter. He has been in power for nine years but still cannot solve this case. The Parliament gave positive response in 2009 by issuing four recommendations delivered by a special committee established in 2007-2009. The aim of the committee’s establishment was to follow up the investigations result concluded by the National Human Rights Commission which was submitted to the Attorney General in 2006. The four recommendations were for the President to establish an Ad Hoc Human Rights Court to examine the case of involuntary disappearance; for the government to find the 13 activist who are still missing; for the government to provide compensation and restitution to the victims; and for the Government to ratify the International Convention on the Protection of All Persons from Enforced Disappearance. These four recommendations are yet to be executed by the President as of today. What are the obstacles you and other victims have experienced in the search for justice? The main obstacle is that the state tend to ignore the settlement of past human rights violations cases. This happens because who are serving in the government today are individuals involved in the abuses. The biggest challenge ahead is to make the past human rights issues being discussed widely in the society as much as for instance, the issue of corruption. Victims of enforced disappearance have joined political parties founded by the persons who allegedly gave orders to abduct you. How do you feel about this? Personally I do not mind if my friends join a political party. Yet what troubles me is the fact that a former friend of mine entered the political party led by people who are responsible for the abductions and enforced disappearances or other serious human rights violations such as the People’s Conscience Party (HANURA) and Gerindra. I of course cannot do anything to prevent my friends from joining such political parties. All I can do is conducting campaigns to public and persuade them not to elect parliamentary candidates or leaders involved in human rights violations, corruptions and crimes against the environment. People should understand that public officials must have a clean track record. What are your expectations of the current government? The current government only has a year left before the election in 2014 and I do not believe that they will be able to solve this case within such short period of time. Yet I hope the government -especially the president- will lay the foundations of solving the case in the remaining one year. By ‘foundations’ I refer to policies issued by President such as Presidential Decree, Instruction, or Regulation which are in favour of the victims. What motivates you to keep on fighting? It is just something that comes from within me. I am part of the victims and their family. I can understand what the victims feel as I myself have been there. My own mother also always teaches me kindness. Throughout the last 10 years I have been very close to the victims of past human rights violations and their families. They are also the ones who motivate me to keep fighting together in demanding justice. As the 2014 general election is approaching, what message would you like to deliver to the public in Indonesia? I will hold campaigns to the public to persuade them not to elect parliamentarian and presidential candidates who have been involved in human rights violations. I will do so by holding discussions, film screenings, using the media and other means. Most Indonesians do not know who had actually perpetrated human rights violations. For example, neighbours in my village told me that they will vote for Prabowo for the presidential election. They want to vote for him because they do not know who Prabowo actually is. The campaign on do not vote for human rights violators, corrupted politicians and candidates who contribute to the destruction of the environment is part of public education which needs to be held systematically. I am hoping the international community will note blindly believe the reports made by government on human rights situation in the country. If you only listen to the government then you will get a false picture on the situation in Indonesia that everything is fine. It is important for the international community to listen to the voice of the victims or the NGOs. Please do not give false judgment on the situation in Indonesia as what one of the international organisations did recently by giving the President an award or religious freedom of tolerance when actually there have been many cases on discrimination and violence against minorities during his administration. As for the case on abduction and enforced disappearance, I hope the international community will support the victims and their struggles in various means.